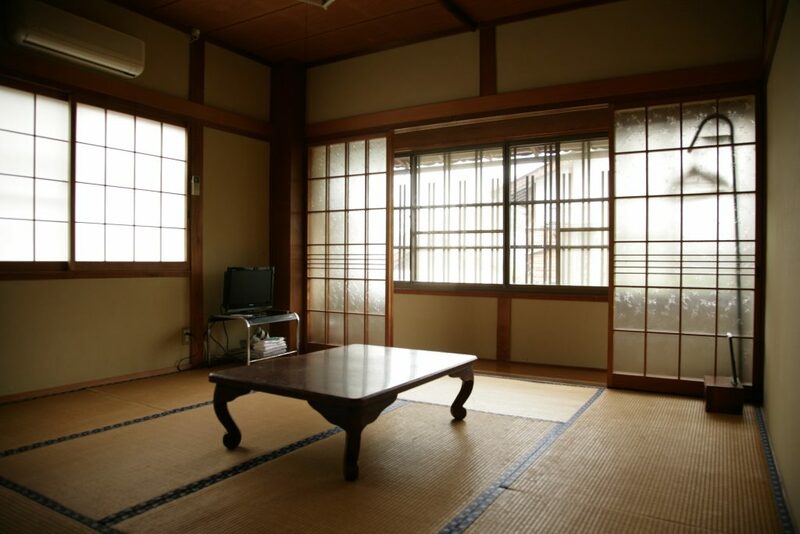 MAGOMECHAYA MINSHUKU GUEST HOUSE – MAGOMECHAYA MINSHUKU GUEST HOUSE |magomechaya address— 4296 magome nakatsugawa-shi gifu-ken 508-0502| phone 0573-69-2038 |+81573692038| tsumago-juku is near. This is the front door of Magomechaya Guesthouse. The rooms of Magomechaya Guesthouse are all air conditioned and fully equipped but not entirely air conditioned. In winter time since the altitude is high, when you step outside the room please acknowledge that it is cold. Not just like in the Urban area Summer time here in Magome is kind a cool,relaxing and refreshing as this place surrounded by plants and many big trees. Communal bathroom and toilet for men and women. There is no private toilet and bathroom in every rooms. Dinner serves in Magomechaya restaurants across the street of the Main Guesthouse. 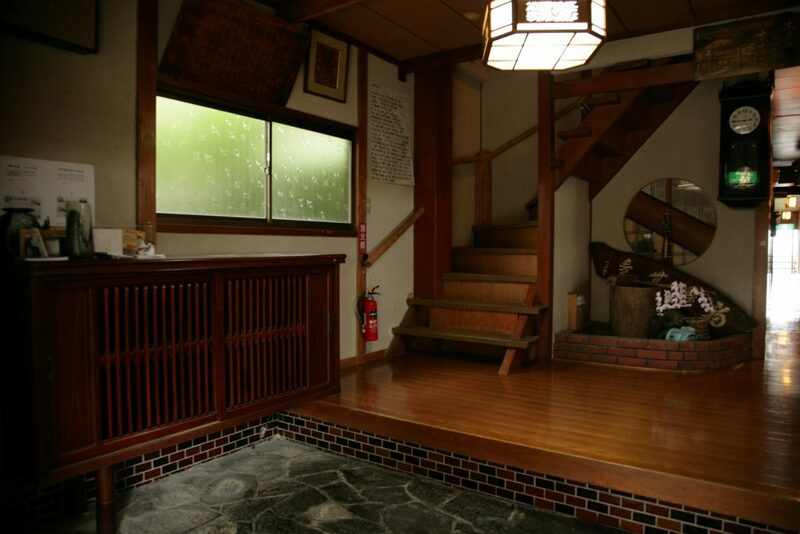 One house away going uphill you can see and visit the Toson Memorial Meseum and it opens from 9:00am to 5:00pm. 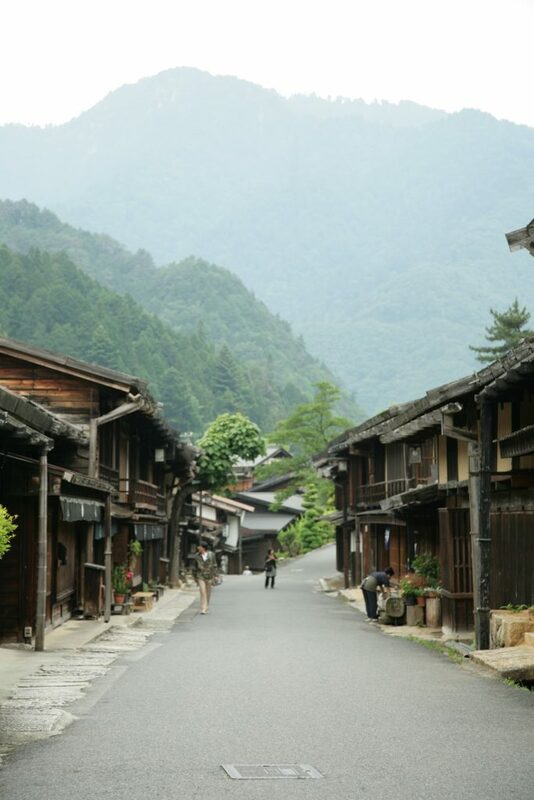 Vehicles are not allowed to enter the Nakasendo road during the day as this is exclusively only for the hikers and for only tourists guests who wants to see the beautiful surroundings of Magome. When you arrive at the entrance of the Guesthouse,buzzer place at the corner of the entrance. (Just please ring the bell to call the attention of the staff and the staffs immediately attends you). Looking to the right, there is a shared lobby space with vending machines . Smoking are not allowed inside the room or inside the Guesthouse as guesthouse are made of woods or made of light materials that easy to burn.Fire hazard will detect if someone smoke inside of the Guesthouse. For smokers ashtray place outside near the entance door. There is a guitar that the guest can freely use it. 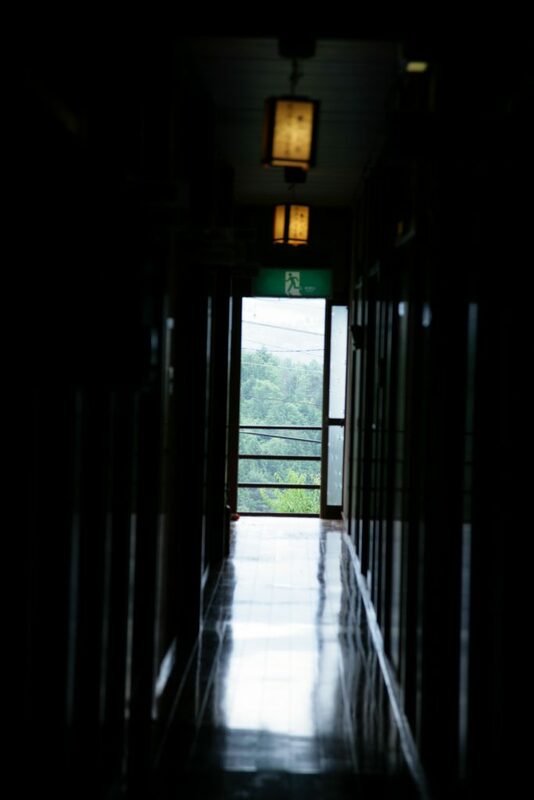 This is the corridor on the first floor. From the entrance you can see straight till the end of the corridor the view of the Mountain Ena with the height of 2191m. You can sit and relax on this place,chatting,drinking hot tea with your family and friends.The guest/s also can play the guitar while others are listening. The buddhist altar also placed in the corner of the lounge which sometimes family use this to pray. 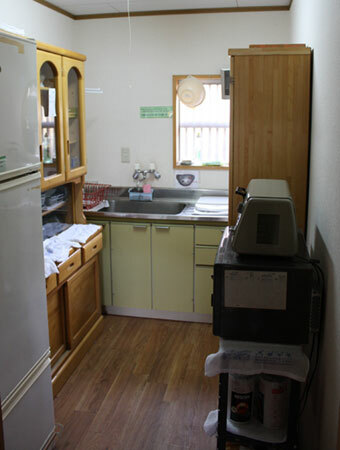 Guest/s can use this small kitchen if they want to have a hot tea. 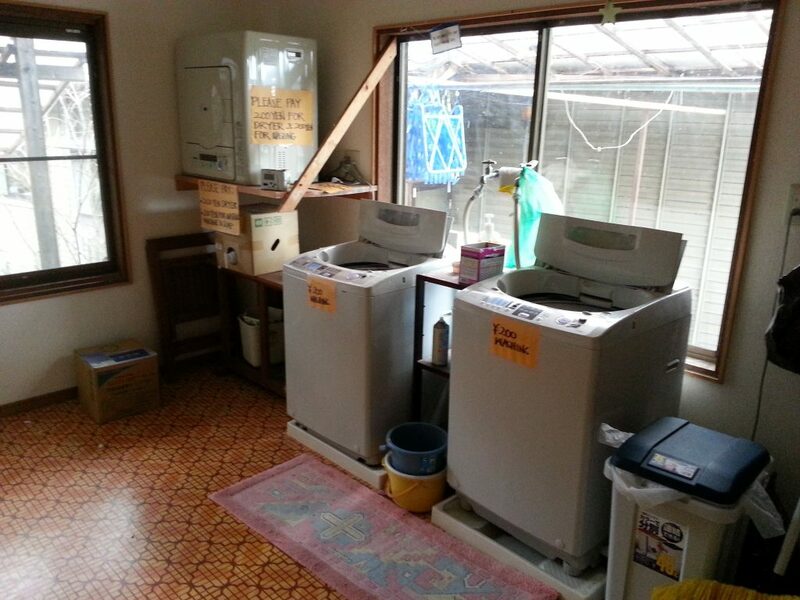 The other guests who dont have a reservation for dinner could also use this kitchen for the preparation of their food. 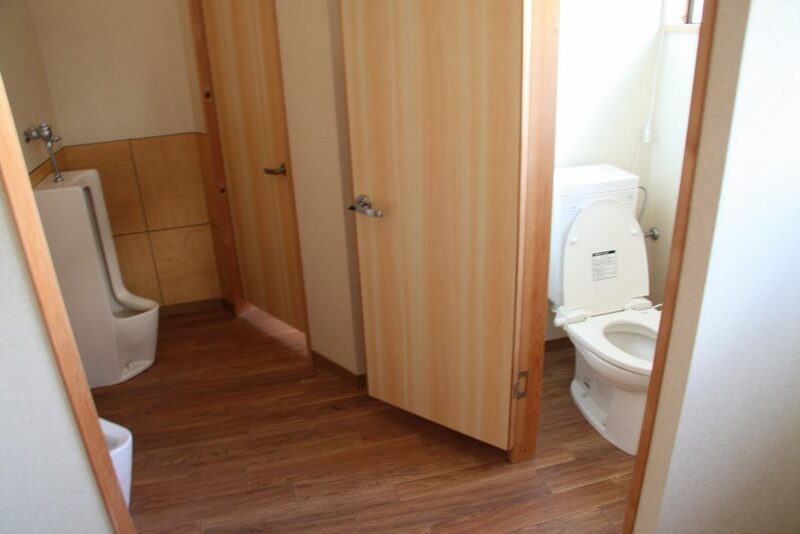 This is a communal bathroom which is seperately for Men and Women. There are 3 faucets each of the bathroom. Towels,Shampoo,Conditioner and Body wash are available.The size of the bathtub is about 160cm in lenght 90cm width and 60cm depth. 2 – laundry machines are available and guest/s can use this anytime.Foreign guest/s travelling for so long oftenly use this area. This is not an automatic coin operated not unlike other launderette. 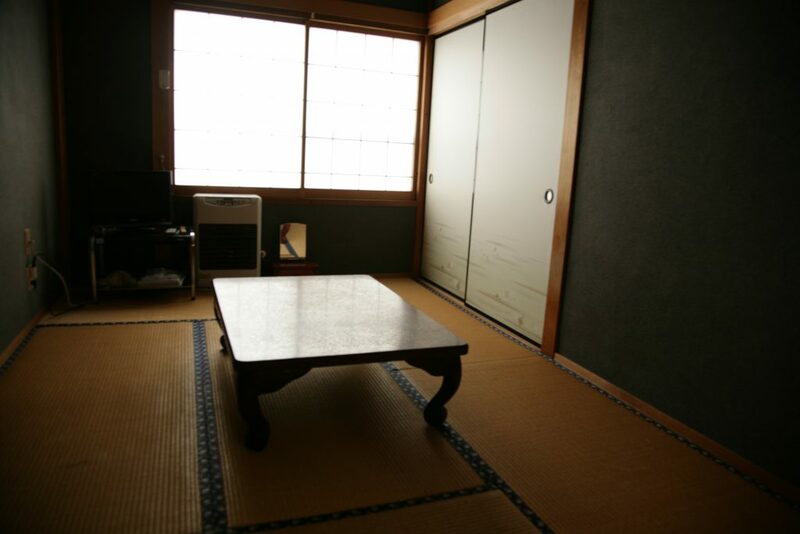 Two big 10-tatami mat rooms (can accomodate 1-5 people). 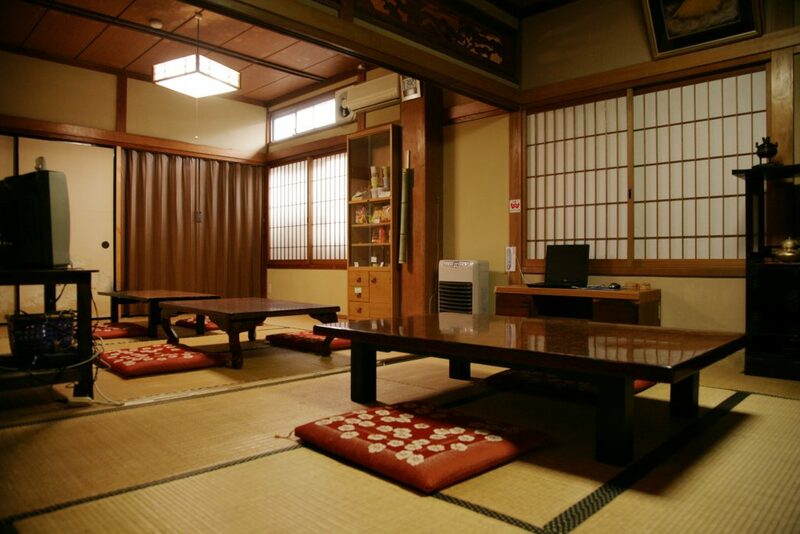 Five 8-tatami mat rooms (can accomodate 1-4 people). 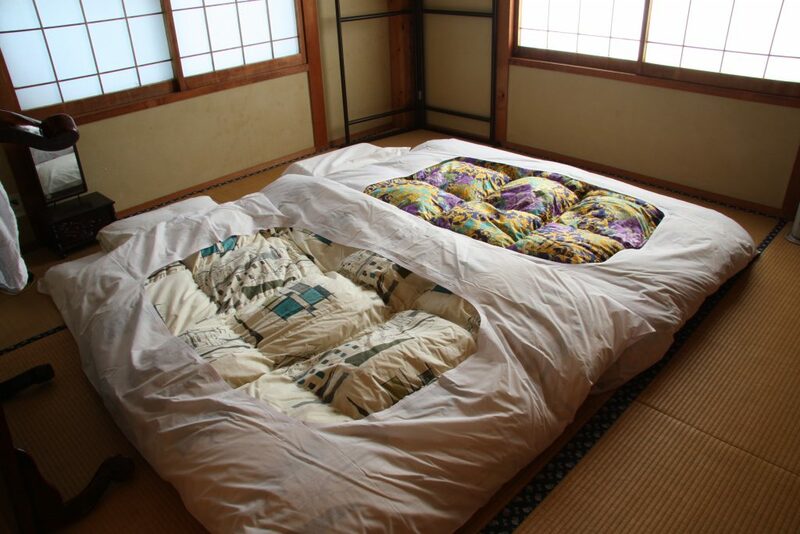 Six 6-tatami mat rooms (can accomodate 1-2 people). 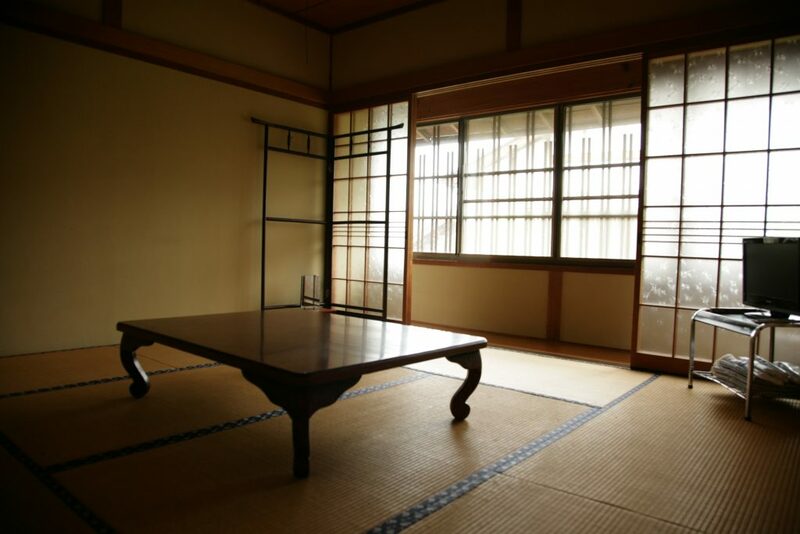 On this room you can see from inside the Nakasendo road. 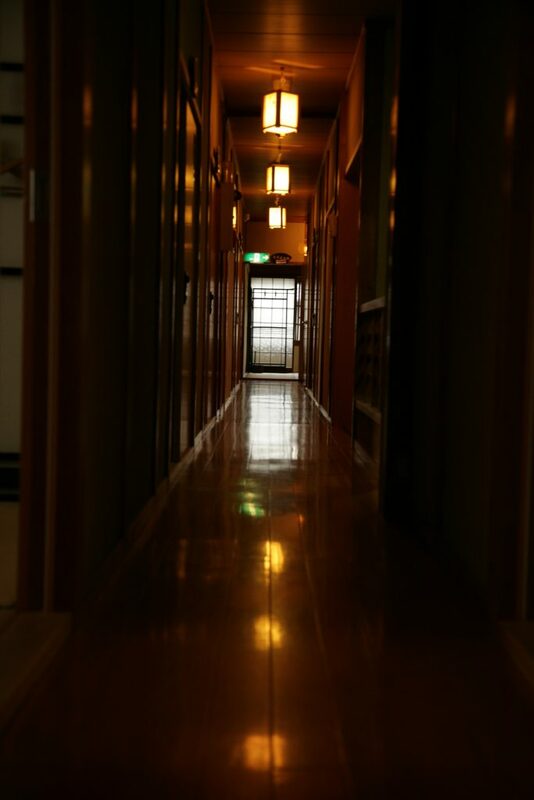 This is the long corridor with rooms both sides. 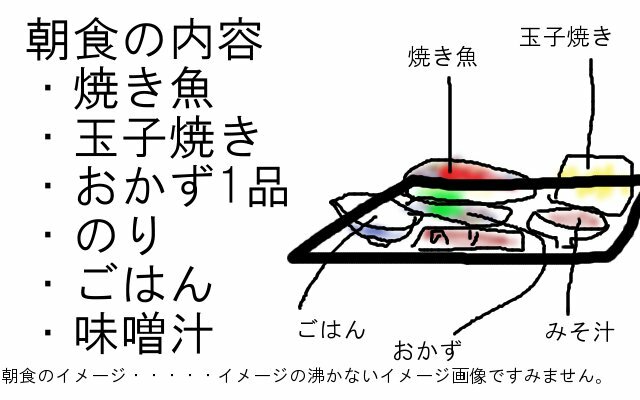 This is the way how to lay the futon. The Guest/s will be the one make their own bed. All futon beds,bed sheets,quilt cover place inside the cabinets. 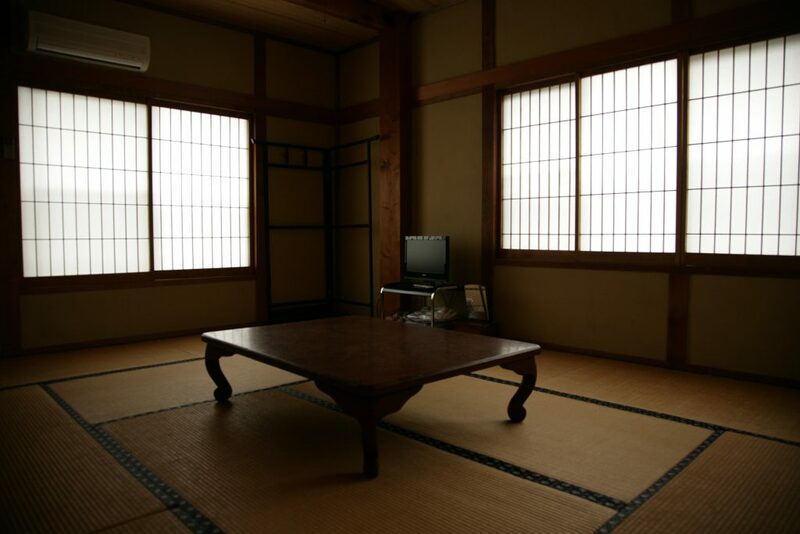 Inside the rooms theres an available yukata or japanese dress that guest/s could wear it inside and out of the guesthouse. Small towels,toothbrush are also available just ask to the staff if needed. No smoking inside the room as the smell will not be taken immediately when it spread it inside the room and also in the futon bed,also the building are made of light material so we are not allow to smoke inside,if the guest/s will smoke the fire hazzrad definitely alarm. Communal toilets and washrooms for men and women. The toilet/washrooms for men and women are seperate. 3-womens toilets and 2 wash basins on the 2nd floor. 2-mens urinals, 1-men toilet with 2 wash basins on the 1st floor. 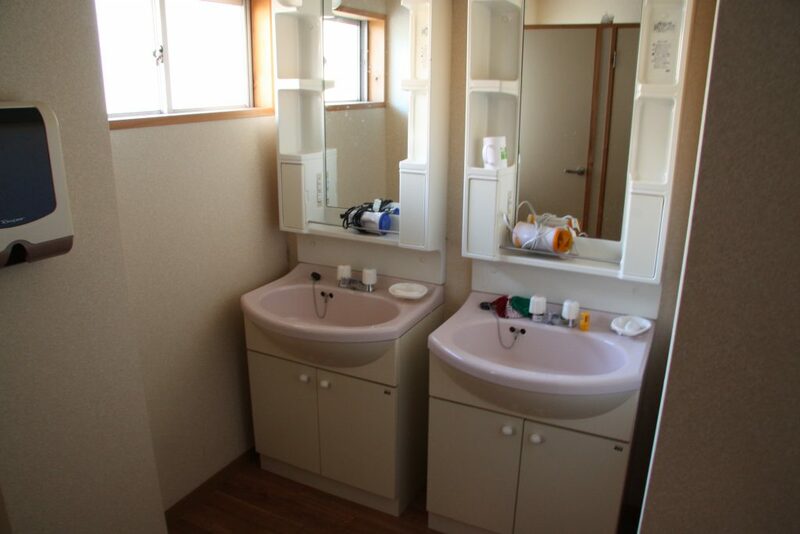 3-women toilets with 2 wash basins on the 1st floor. 10-12 cars can be park. Please click the link for the google map going here from Ochiai to Magome by car.Also we advice not to use the car navigation when coming here as sometimes the car navigation are not updated especially when the car navigation are too old and will teach you the wrong direction and the passenger will be lost,if its possible please use the smartphone for the easy access. But if you only have a car navigator and no smartphone please put the new telephone number 0573-69-2038. Access from Shinjuku station becomes Nagano prefecture route. If you use the Shinkansen, you will pass through Nagoya, so please use here if you are in the Kansai area. There is a Central Highway near in the vicinity of Magomejuku. If the guest/s are from tokyo or nagoya highway, the bus will stop at Misaka parking area. From Misaka parking area the guests can walk from parking are to magomejuku for 15 mins. to 20mins. This is the example of dinner meal. Dinner meal depends on the season. Dinner serves exactly at 18:00o`clock ends at 19:00o`clock. Breakfast serves exactly at 7:30am. Dinning area place across the street of the Main Guesthouse. The left is the inn and the right is the meal. This reservation method has become a very convenient system that you can check your vacant rooms yourself and secure your room. However, there are troubles such as reply mail not reaching, so please. There is work to confirm e-mail address after entering reservation step. 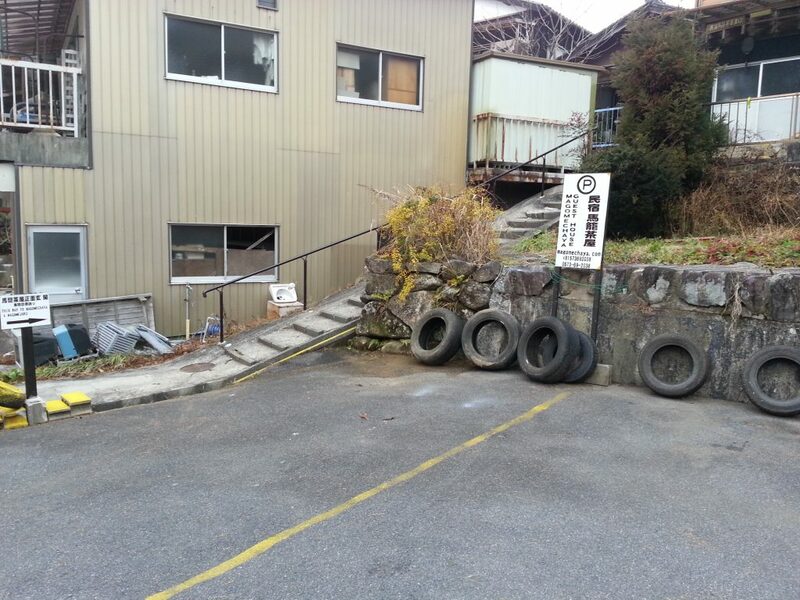 This is a confirmation as to whether the mail sent to you from Magome Tea Shop will arrive, so please be sure to go. And would reserve without confirmation of whether the e-mail arrives, the reservation to have not received the e-mail to the customer is gone established, at a later -show cancellation fee 100% of the claims will become a . Although it is a convenient system, we also check vacant rooms with this system at the time of customer inquiries by telephone or e-mail, so please handle the reservation with full responsibility. For the guest/s who wants to make a reservation by phone calls or have some inquiries please understand that there are times that we cannot attend your calls as we are probably not around in the area. If you want or wish to have a reservation with us please go thru our reservation system for the booking. 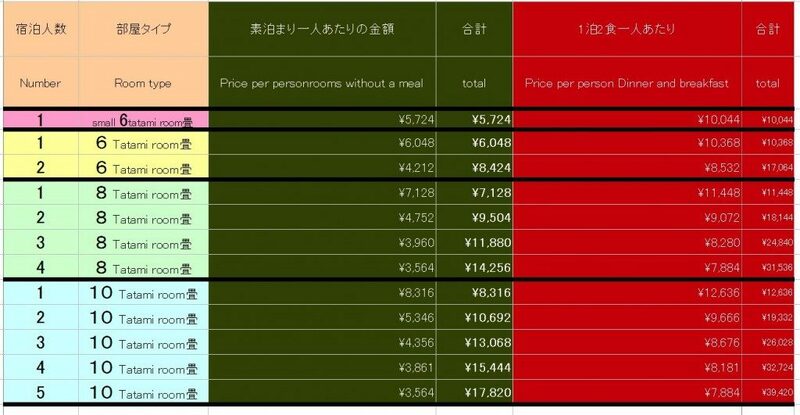 Dinner price per person is JPY 3,240. 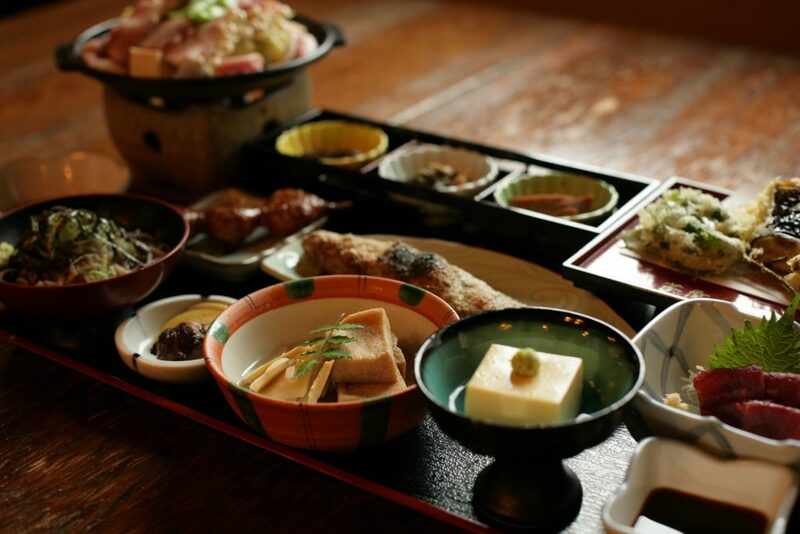 Breakfast price per person is JPY 1,080. Prices of meals will subject to change this coming fall season 2019. 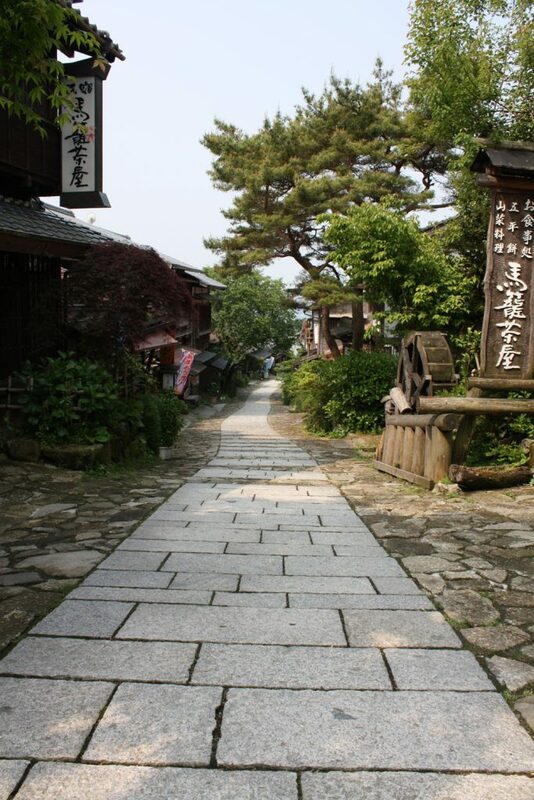 Magomejuku is a small post town of Nakasendo road and one of famous town in edo period. it is having a 600 meters from down to bottom. Old houses are main in here which well preserved from edo period,small inns,souvenir shops selling local products,restaurants offering soba noodle and others. Magomejuku to Tsumagojuku are very popular with those who like hiking. It is popular especially for foreigners nature`s lovers and interested to the old history of it. Magomejuku to Tsumagojuku hike takes about 3 hrs. August-Nagashi soumen (Noodles with a very thin size flow in a long bamboo flume with very cold and clear water running through it and its famous in summer here in japan. Tsumajojuku Is a post town next to Magomejuku. 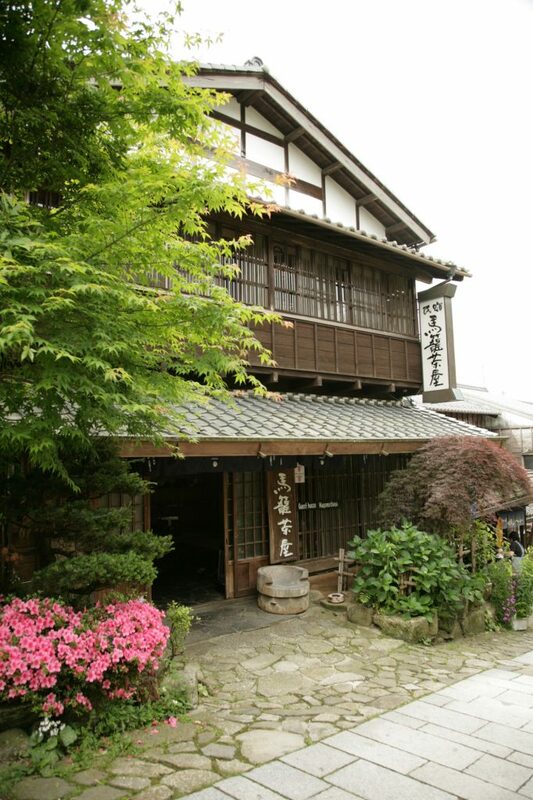 Tsumagojuku is also know as one of the post town in Nakasendo that the building and houses are well preserved. 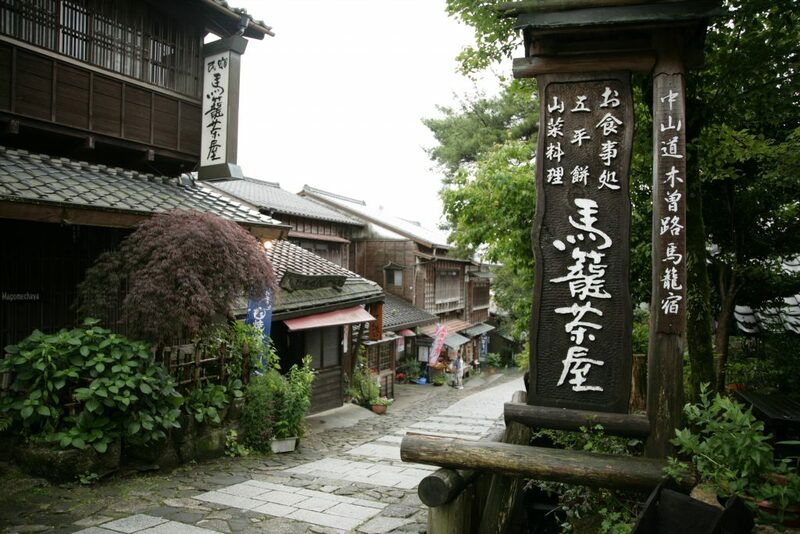 There are 69 post towns in Nakasendo during edo period which well preserved until now. Magomejuku and Tsumagojuku are 43rd and 44th post town. 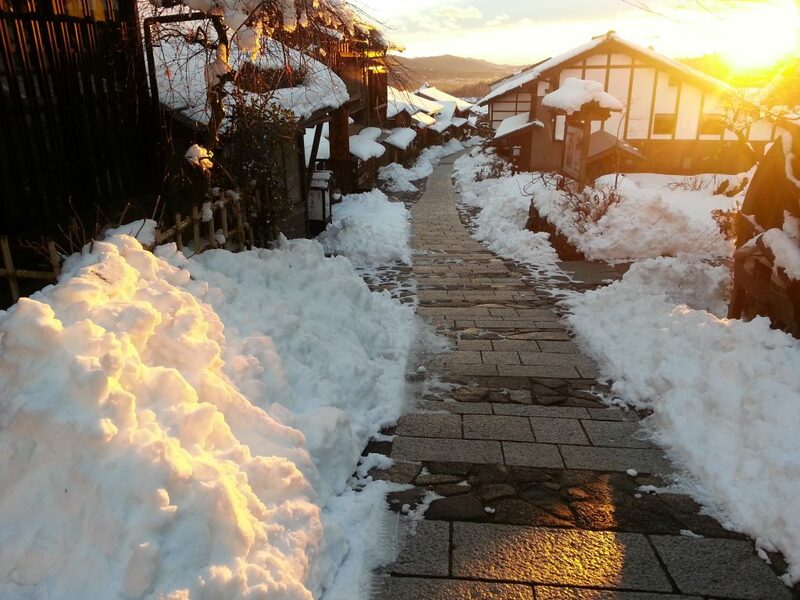 Magome is also part of Kiso Road, but there are 11 station towns in about 80 km. Niekawajuku, Yabuharajuku, Naraijuku, Miyanokoshijuku, Fukushimajuku,Agematsujuku, Suharajuku, Nojiri juku, Midonojuku, Tsumago. 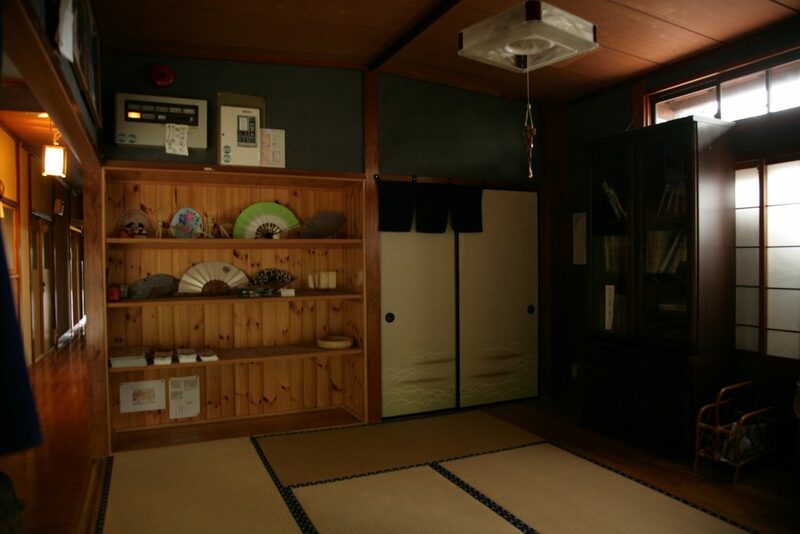 The souvenir shops are almost the same as the opening hours of Fujimura Memorial Hall (tozon kinenkan). Golden Week , Summer Vacation even autumn season,some shops open till the evening. 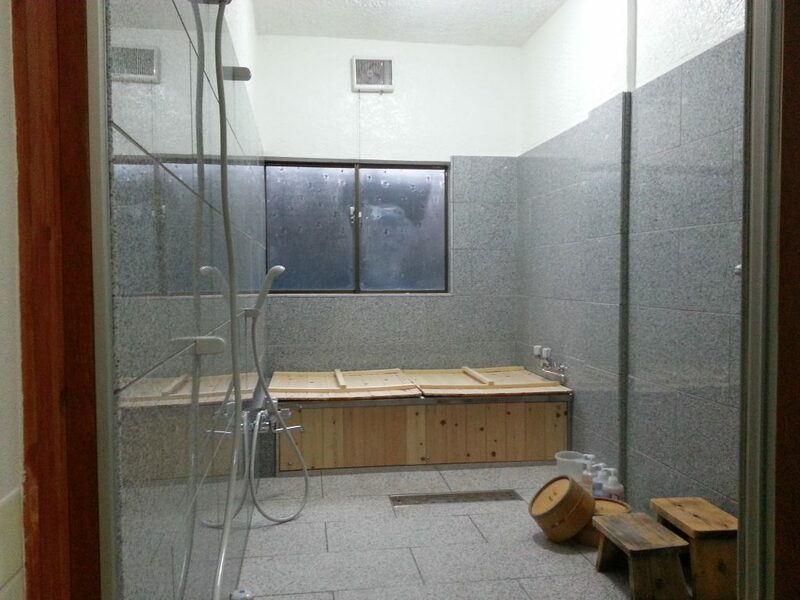 A hot spring 5 minutes drive from Magome which is located in Misaka area which is also near in Misaka Highway Bus parking. Although guest rooms are air-conditioned,but not all the whole establishment are air conditioned. 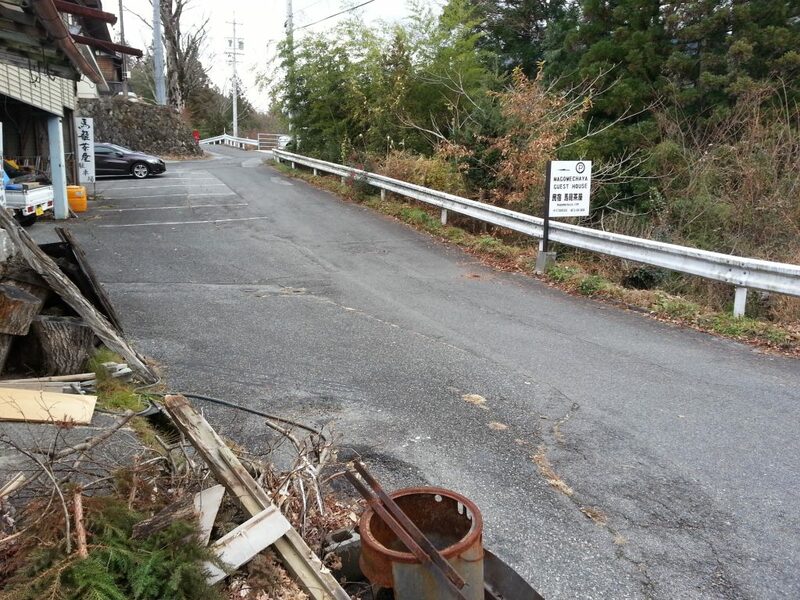 Because of the rule of the majestic, the installation of the signboards here in Magome has to be minimized on the landscape, so it is difficult to find the guide to the parking lot. Because we are doing it with a small number of family members, people do not always stand in the front door or receiving area, so if you are going to stay at the hotel you can use the buzzer to call the attention of the staff. Guest rooms are not a soundproof materials so you can hear the voice and sounds outside the room. You must keep quiet after 21 o’clock so as not to bother other customers. Dinner serve exactly at 6:00 pm and ends at 19:00. The online reservation method has become a very convenient system that you can secure your room by checking vacant rooms yourself. However, there are troubles such as reply mail not reaching, so please. There is work to confirm e-mail address after entering reservation step. This is a confirmation as to whether the mail sent to you from Magomechaya Guesthouse will arrive, so please be sure to go. And would reserve without confirmation of whether the e-mail arrives, the reservation to have not received the e-mail to the customer is gone established, at a later -show cancellation fee 100% of the claims will become a . Although it is a convenient system, we also check vacant rooms with this system at the time of customer inquiries by telephone or e-mail, so please handle the reservation with full responsibility. You can check the vacant rooms here. Copyright © 2019 MAGOMECHAYA MINSHUKU GUEST HOUSE. All Rights Reserved.